I’ve always been a big fan of tennis games. Even when I was a little kid, RealSports Tennis was one of my three favorite games for the Atari 2600, along with H.E.R.O. and Adventure. In the days of the Sega Dreamcast, Virtua Tennis was one of the best games for the system . I loved love the sequel, VT2. I skipped out on VT3 since it came out almost a year before I purchased my PS3 and I definitely passed on VT2009, as it was made by Sumo Digital, as they have pretty much made underwhelming crap (aside from Sonic & Sega All-Star Racing) and their version of VT3 was horrible compared to the versions made by AM3. Thankfully, the development team that originated Virtua Tennis, and also gave us Crazy Taxi and Cyber Troopers, has been given back the reigns of their creation. I knew after trying the world tour demo through PSN that I had to buy this game, but I’ll admit, I was torn between the PS3 and Wii versions of the title. I was most interested in the motion gaming, but then I discovered neither version actually let you fully immerse yourself in that type of gameplay. Instead it was a lip service exhibition game that you could play and that was it. Disappointing to say the least. Finally I went with PS3 since AM3 primarily optimized the game for that system. It’s been almost a decade since I’ve played a new tennis game, but I clearly remembered the quality of the Dreamcast releases. Has the series held up or is this merely a Madden-esque bare bones update? 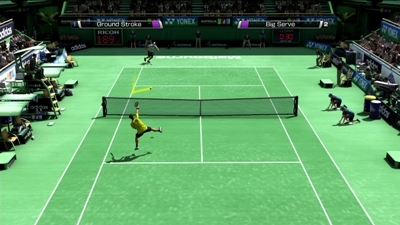 There are a lot of options in Virtua Tennis 4. First up is the lauded World Tour mode, which takes a homemade character through a full year in the life of being a professional tennis player. You gain experience points in five different conditions: Stroke, Defense, Tactical, Net Play and Condition (Health). 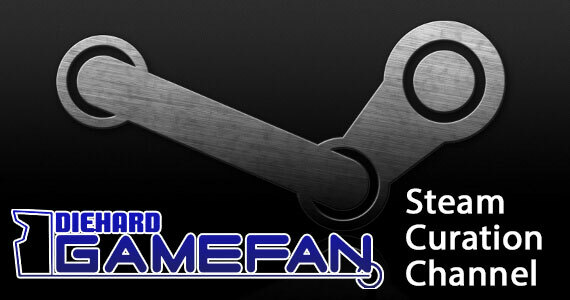 You raise each of these categories by playing in mini games. You also gain stars which act as your overall player rankings. These are earned by playing actual tennis matches. You need to balance out your play of both to get the most well rounded character. World Tour takes you around the world as you make friends, rivals and fans. There’s a lot here and it’s all pretty fun. It’s up there with MLB Power Pros as the best “RPG Mode” for a sports game I have ever played. Arcade Mode is very similar to what you played on the Dreamcast or in the arcade. You pick a player or two doubles partners and have them go through tournaments trying to beat the game and achieve a high score. One heads up though – the trophies for achieving a certain score in Arcade Mode ONLY apply to singles. Doubles will not unlock either of them. As well, there is the usual evidence that women’s tennis is an afterthought in this game – an issue that has plagued the Virtua Tennis series from the beginning. If you play as a woman in singles or doubles, be prepared to encounter male characters as your final opponents. This can also happen with special matches in World Tour. It would be nice to see some female legends or even more female characters as there are only seven to the SEVENTEEN male characters. Would it really be that hard to get a Steffi Graff, the other Williams sister or the like? 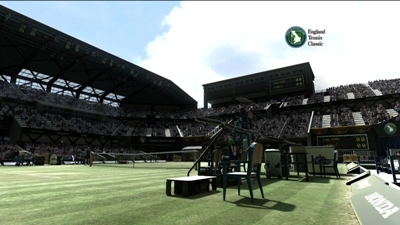 Exhibition Mode is merely a quick singles or doubles game with variable options. Practice is a series of seven exercises to get you better at the game. Party Mode offers nine mini-games, one of which is Move only and it can only be found here. My favorite is Egg Collector, which teaches you footwork and helps you hatch baby chicks! Others include a tennis version of skee shooting, a tennis poke game, hot potato, playing in extreme speeds and more. They are all a lot of fun and you’ll see them regularly in the World Tour as well. Move Play is the only place where you can use your Move controllers, and it’s basically Exhibition, but with worse camera angles and kind of crappy gameplay. To be honest, I tried VT4 on the Wii and PS3 and liked it with Wii Motionplus far better than with Move. I used to play tennis regularly, so I like to move like I was actually playing the game. The Wii’s motion controls allow for this, but Move does not due to the emphasis on the EyeToy. Just keep that in mind. Network lets you play online, but as PSN has been down for three weeks, I was unable to try any of this. Finally, My Club keeps track of all your statistics in agonizing detail. Overall, the options here are wonderful and I never got bored trying the game out. Again, I wish the game treated both women’s and men’s tennis equally, and I wish the Move implementation actually was more than an afterthought (which is not how they touted they game), but what’s here is really a lot of fun, and even if you’re not a tennis player, you can get a lot out of the myriad of options here. Virtua Tennis 4 is very pretty. All of the actual professional tennis players in the game look as close to their real life counterparts as technology currently allows. Even homemade characters made in “create-a-player” look almost as good, as they can be very lifelike. Just fooling, around I accidentally made a character that looked exactly like Shannon Elizabeth… so I named her BooBoo Kittyf*ck and she went on to win the Asian and European legs of the season. Every character is animated perfectly with lifelike expressions and movements. You can even see beads of sweat dripping from their foreheads in long-running matchups. You can get a lot of costume options to unlock for your characters and I ended up dressing up BooBoo like Bret “Hitman” Hart for most of the game, right down to a heart shaped tennis racket. Hilarious. 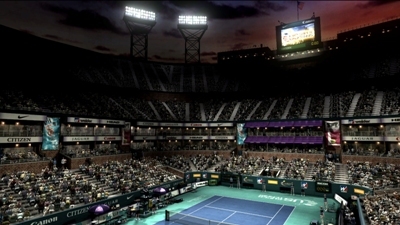 There are quite a few court options (although many have to be unlocked in World Tour mode) and they all look great. The judges, bystanders and backdrops look ripped from real life, and although the graphics aren’t as good as the cut scenes, that’s because it’s panned out to show you the entire court. This is still the best looking tennis game I’ve ever seen, though, and even in doubles mode when the action is fast and frantic, there’s not a hint of slowdown. 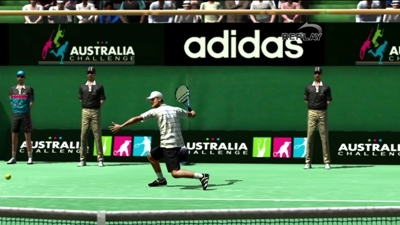 Virtua Tennis 4 is a great looking game in all aspects and I only wish a lot of the fictional characters from World Tour mode could be available in the other modes of the game to give you more character options. There really isn’t a lot of sound to talk about. The music in the game is background noise and nothing else. The tracks are neither annoying nor memorable. There aren’t a lot of sound effects either. You have half a dozen different voices for men and another six for the women. These voices are for all characters, including the real life tennis pros, and they consist of grunts, moans, and shrieks. I don’t know why AM3 didn’t actually sample the pros’ actual voices, because it’s not like they had to read lines or recite dialogue with any emotion here. Everything else sounds pretty realistic though. The sound of the ball hitting the court differs with each type of court you are playing on. The voice of the announcer differs by continent. The audience claps, cheers and gasps appropriately. Sure there isn’t much here aurally, but what’s here fits the game well enough. Sadly, this is probably where the game is its weakest, as there are notable bugs and gameplay issues that plague the game. It’s still a lot of fun to play, but it’s definitely a massive drop in quality from the Dreamcast era of the series. The major bug is that the game has trouble detecting button presses at times. Now I don’t mean mixing up a lob for a backhand or anything like that. I mean the game just doesn’t recognize that you have pushed a button or moved the analog stick at all. There are times where you are doing both and your character will just sit there as if frozen solid. One game I went from 40-Love to a Deuce because three times in a row my character stopped responding even while I was jamming on a button five or six times just to get it to swing. Oh my god, I can’t tell you how loudly I swore on these occasions, but I can tell you that this happens regularly. More than half the points I gave up during my time with VT4 were because the game didn’t recognize my movements or button presses, and that’s really bad. The other half was either that the game decided my shot was “out” for some reason or because I just screwed up and was nowhere near the ball. Still, when you can honestly see your character not moving and you’ve encountered this issue with four PS3 controllers on two different systems, you know it’s a massive problem with the game. 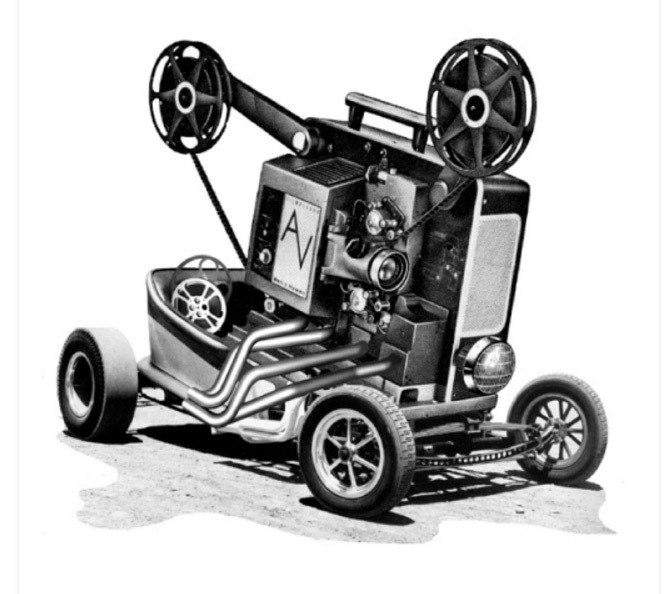 Another notable issue is the controls themselves. Each shape button is a different shot. X is top spin, Triangle is Lob, O is your special shot and Square is slice. However, there is no actual onscreen difference between top spin and slice, and as a person that has played tennis for a long time, that’s kind of insulting a next gen game couldn’t get this right and something from several console generations ago COULD. You are also supposed to hold a button down for more power, but in truth, all it does is add distance to your hit, not speed, and that’s what should really happen here. If I smash a ball by the net it should be a fast and short hit, not slow and long, but that’s all “power” does. This makes it very hard for either your or the computer to score a hit unless you use your special shot once it is powered up or you go for a diagonal hit when the character is on one extreme of the court. Shades of RealSports Tennis for the 2600, which is kind of sad for 2011. Other than these two admittedly very big issues, the game plays nicely. When the game notices your controls, it’s very tight and often feels like a real game of tennis. Each character has a gameplay type that determines their strengths and weaknesses along with what charges their special shot. This is a very nice touch, as my character in World Tour went from “hard hitter” to “counter” and finally to “strong defense.” You character will play very differently when you switch from one “kit” to the next, and it was fun to see what best fit my play style compared to where the computer said I was performing best. The gameplay with Move wasn’t as good. Again, I felt Wiimotion Plus performed better, but Chuck will be reviewing the Wii version so we’ll let him cover that. Move just felt awkward and as if whoever designed it hadn’t ever played tennis before. 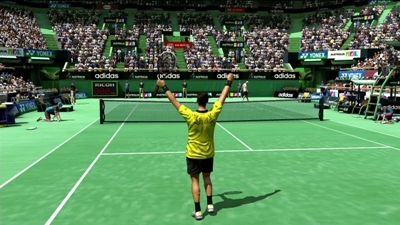 The game takes place in more of a first person perspective, and although the movement to controller detection ratio is great, the way you must hold the Move controller doesn’t really feel like how one would hold a tennis racket, and the onscreen hand is holding it in such a way that their wrist would snap with a solid backhand smash. As well, expect to encounter a lot of recalibration if you actually want to move around like you were actually playing tennis, which means you’ll just be snapping your wrist instead of actually moving if you want it to play correctly. Distressing. I won’t lie. The gameplay as a whole does have issues, and the game probably needed a lot more fine tuning before it was released. What’s here is decent and it’s a lot of fun, but the control detection issues occur way to often for it to be acceptable, and people who actually play tennis for real will be annoyed with the physics and other gameplay problems I’ve mentioned. Again, I had a blast with the game, but I enjoyed Fallout 3 too, and no one is going to deny that thing needed a few more months with quality control before being released either. With the ability to make multiple characters and put them through World Tour mode, you can get a ton of replay out of Virtua Tennis 4 out of just that one mode. 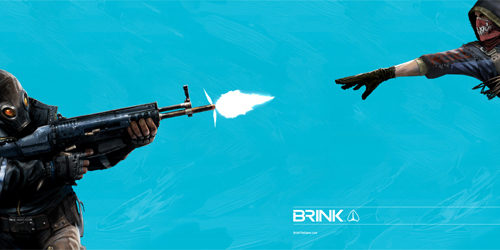 Each time you play through it, you can unlock new opponents, design your character differently and end up with your character in a completely different position at the end of things. I put fifteen hours into the game with a single character in World Tour mode alone. Unfortunately, you can’t carry a character over to a second season with everything intact, which makes achieving certain star levels all but impossible for all but the best gamers. In truth, it feels a lot like the original CAW season mode in the very first Smackdown game for the PSX, albeit it’s much longer and a lot deeper. Then, when you add in online play, multiplayer party games and the other forms of play, you can whittle away an amazing amount of time with VT4 – perhaps as much as a season mode with any MLB or NFL game. Aside from the occasional command detection issue, the game is very well balanced. In World Tour Mode you have your health bar to manage. The higher your level, the easier your special shot bar is filled after each time you use it. If it gets too low, you’ll be playing with an injury and be noticeably slower. In tournaments you’ll also notice each leg gets harder than the last. Arcade mode also offers this growing difficulty, although again, it is annoying that the game forces even the women to play against dudes as their final opponents instead of having some female legends or even a few more playable female pros. Even better, characters have their own distinct personalities and gameplay style, and if you play them enough you’ll figure out their weaknesses, such as which opponents can’t return a serve at maximum power and which ones stumble a lot. There are multiple difficulty settings in Arcade mode, and each is noticeably harder than the last; even on easy, there will be some players that you’ll have difficulty with. In World Tour mode, difficulty goes out the window for “play style,” although it’s basically the same thing. Each matchup that you play doesn’t guarantee you’ll have a perfect game against your opponent, and that’s a great thing. I constantly felt challenged, even when I won the tournaments. I worked for some of those wins, which is all the more reason I wish everything could have been motion controlled. It would have been a great supplement to my workout. This is actually the fifth Virtua Tennis, and aside from the mini games and a nod to motion controls, there really isn’t a lot that’s new here. 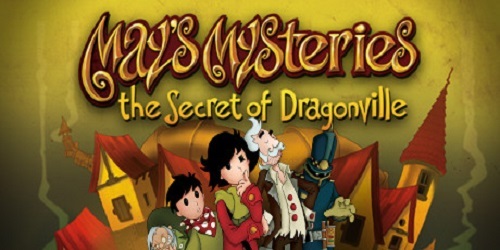 World Tour mode has not only been done in other sports titles, but a version of this has been around in every VT title since its first home release back in 2000. So really, there’s nothing here to really draw you in if you own previous editions of the series. The controls were far superior in 1 and 2, and as much fun as I had with VT4, if you own previous editions of the game, you’ll just find this is more of the same here. As much as I love playing tennis, this is actually the first tennis video game that I’ve formally reviewed, which is because I really haven’t picked one up in a decade. I missed the last two VTs and every Top Spin simply because I had other games to play and because I was content with my Dreamcast versions. However, this is the most addicted to a game I’ve been since Baldur’s Gate: Dark Alliance 2, and that was back in 2004, wasn’t it? I put eight hours straight into this game one night. I just couldn’t put it down. I was constantly unlocking some new item or raising a level or approaching a tournament or was close to earning a medal or reward. I found myself swearing like John McEnroe if I lost a match by a single point… or like a platoon of sailors if the button detection issue happened. I actually killed a joystick playing this game from all the button presses. Eventually I just wore out the X button on my Dualshock 3 so I had to move to one of my other controllers (which is how I first discovered there was a detection issue with the gameplay). I should be finishing up Raincliff to review. I should be finishing off the last bits of Mortal Kombat 9. I should be done with VT4 and getting ready to trade it in by now, but I CAN’T. STOP. PLAYING. IT. I know I can’t keep it because I get furious with it like I used to back with Eternal Champions as an 8th grader, but for now, this is my sweet, sweet smack. Although tennis isn’t a big sport here in the States compared to basketball, football, baseball or hockey, it does have its following. As well, I know people who like playing video game tennis more than the real thing. 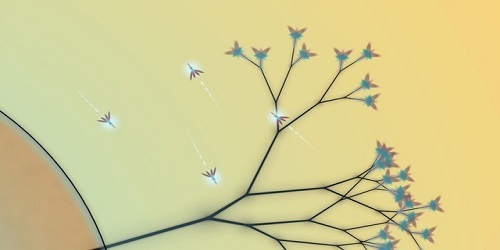 It’s easy to learn, it has simple gameplay and its surprisingly fun. 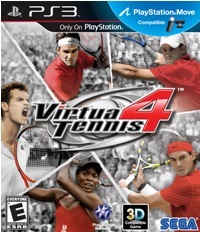 Still, I can’t see Virtua Tennis 4 being a huge seller simply because tennis games never do. They get critical acclaim and have a small but loyal fan base, but the average gamer is going to pass on it simply because it’s not a “big” sport in America, nor is it the type of game one would normally think to pick up. Now if the average gamer was to pick it up, they’d be blown away by the experience and the quality, but they’d also take issue with the gameplay for the same reasons I noted a few sections ago. Call it a push here simply because the game doesn’t have the audience, but if you give it a try you’ll have fun with it, even if you don’t fall in love with it. Although Virtua Tennis 4 has its flaws, such as short changing female characters and some control issues, it really is a lot of fun, and World Tour is one of the most engrossing things I’ve played in years, even if every version of VT has had some incarnation of it going back eleven or so years. I loved creating my own character, watching them form relationships and rivalries and seeing them level up. It was like an action RPG without any of the angst. The game does pay some lip service to motion based gaming, and it’s the prettiest tennis game I’ve ever played. Sure there is room for improvement, but what’s here is good, and since it’s ten dollars less than the usual MSRP for a game these days, you really do get your money’s worth here. 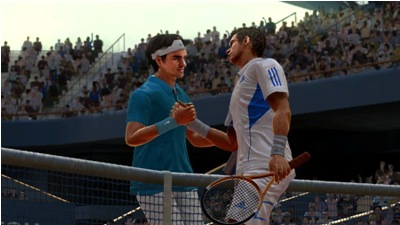 Virtua Tennis 4 is a fine addition to the series, and it’s great to have AM3 taking back the reigns from Sumo Digital. There are a few gameplay issues, and female pros are definitely treated as second rate compared to the men, but the game looks great and is an amazing amount of fun. World Tour will have you hooked for days as you create new tennis players and try to outdo each previous season. The motion based bits are pretty mediocre in quality, so stick to your Dual Shock and you’ll definitely get your money’s worth here.